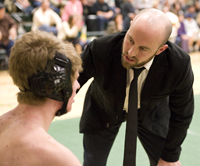 Wood River wrestling coach Shawn Huntington encourages a Wolverine wrestler during the Feb. 7 “Senior Night” dual meets on the Hailey mat. The Wolverines traveled to Canyon Ridge High School in Twin Falls for a full day of Great Basin Conference tournament action Wednesday—with the top four finishers in each of 15 weight classes earning trips to further competition at the state level. Seniors Chris Carnes (285 pounds) and Tommy Bailey (152) as well as freshman Ryan Anderson (106) earned district first-place championships, and 10 Wolverine matmen qualified for Feb. 22-23 State 4A tournament at Holt Arena, Pocatello. It was a very competitive meet, Canyon Ridge (308 points, 3 district winners) capturing its first-ever conference title ahead of defending champ Minico of Rupert (239.5, 2 winners), Jerome (219.5, 3 winners) and fourth-place Wood River (207, 3 winners). In fifth was Twin Falls (202.5, 3 winners). Carnes upheld his top seed with a pin in the 285-pound final. Second-seeded Tommy Bailey upset No. 1 seed and Idaho second-ranked Kaleb Price of Canyon Ridge 4-3. And No. 2 seed Ryan Anderson was a decision winner over Minico’s Blake Gilchrist, just a few days after Anderson lost 5-3 to Gilchrist in a Wood River-Minico dual meet on the Rupert mat. Another Hailey top seed, senior 170-pounder Storm Anderson, injury defaulted in the finals due to a knee problem and placed second. Huntington said he hoped Storm would be ready for state next week. Two-time district champion Cooper Bailey, a junior, placed second at 132 pounds. Third-place finishers were senior Thomas Heiden at 195 and senior Jared Anderson at 132. Finishing fourth and making state were freshman Colby Castle at 98, junior Kaleb Guisasola at 113 and senior Tim Boyle at 120. Wood River finished fifth as a team last year at the GBC meet and qualified seven of its 15 district wrestlers for state. Narrowly missing state trips this year with fifth-place results were junior Kyle Clark (160) and sophomore Jackson Toothman (182).